May may be a veritable buffet of new K-dramas left and right, but May also means the Summer movie season is about to start (or in Hollywood, it’s already long started two weeks ago). One of the biggest Summer movies in Asian cinema this year is sure to be My Kingdom (Da Wu Sheng 大武生) starring Han Geng, Wu Zun, and Barbie Hsu. I posted about the plot and production history here. The movie wrapped production early this year, and held a press conference this past weekend to unveil the first poster and trailer for the movie. I have to say that it looks good. But looking good in trailer form don’t equate with good movie – especially if the main leads acting don’t hold up. I really did like the trailer a lot, so here’s to hoping. I was surprised to see how much of a thriller and action-oriented this movie was. I suppose it was my own misconception considering the characters are all classic opera performers. But they are all performers skilled in martial arts and play the warrior roles, so I suppose art imitates life imitates fiction. Male voiceover: Whomever is a genuine da wu sheng (martial arts performers in a classic Chinese opera theater), then this wooden banner belongs to him. Barbie: Whomever obtains that wooden banner, is fated with bad luck. Male voiceover: I am the most powerful da wu sheng, so I make the rules. Male voiceover: There are innumerable people seeking revenge on me. Let them come! Barbie: A challenge to you, a martial arts duel for the right to the wooden banner. Title card: Wu Zun, Han Geng, Barbie Hsu, Martial Arts Director: Sammo Hung, Director: Gao Xiao Sheng, My Kingdom. Male voiceover: As long as someone from my martial arts house is alive, (I) will execute your entire family. Title card: Summer 2011, Anticipate the Allure of the (Martial) Arts. Explanation – The wooden banner is an important status symbol. Like noble houses have a wooden banner hanging outside to announce the name of the household, or martial arts studios have wooden banners outside to announce its presence, this particular wooden banner reads “The #1 Martial Arts Opera Perfomer”. It likely is a prize to be won and lost amongst the da wu shengs of that era. 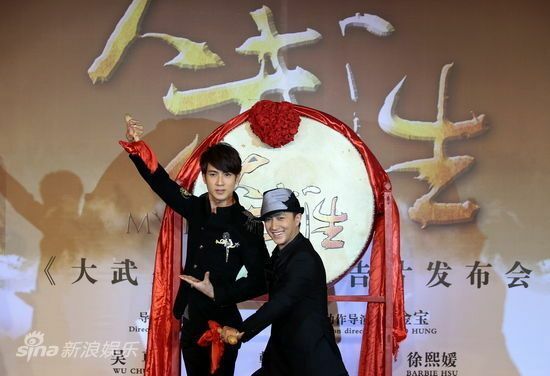 The pictures above are of Hang Geng and Wu Zun at the press conference. Do they look fabulous together or what? And the costumes for this movie? My brain is also drooling at the period fashion fest. Thanks Koala for this big news. It is a MUST watch movie. 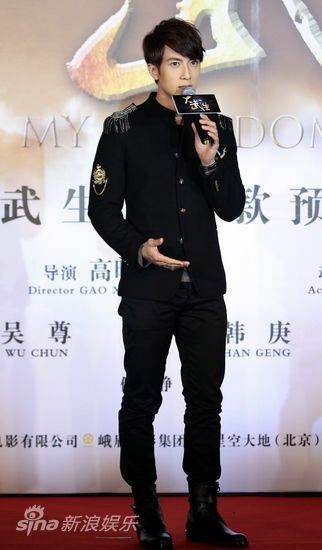 I am a big fan of Wu Chun and also a fan of Han Geng. I like Barbie in her role as San Chai in Meteor, well she is not so overact like Ku Hye Sun in Boys Over Flowers. And she surprised me with the acting in Summer Desire. Have not seen her in action movie and I want to see how she fair. IMPRESSIVE trailer!! it looks amazing!!! i didn’t really like it at first as it reveils next to nothing of the story for me…. but on second thought… this trailer is much better than most hollywood trailers showing ALL highlights (leaving nothing to guess or to be surprised about while watching the movie)… Heh, this one sure is a good tease! thanks ockoala for the post! I don’t know if it’s me or did somehow Wu Zun look a little posh than Han Geng, Wu Zun looks like a Husky and Han Geng look like a Bull Dog on those winter clothes. Well no I don’t see Barbie Hsu as a martial artist so when she flew like that all I could say was whoa she gained weight, those legs are big. 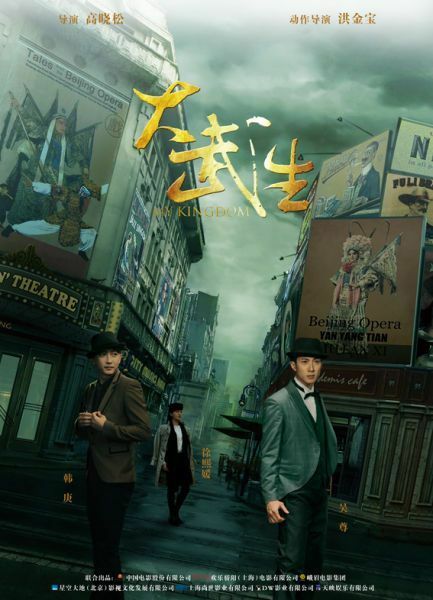 The trailer left me scratching my head, usually when Jet Lee comes on screen even if it’s a foreign language I could feel his intensity, but this trailer left Zun and Hangeng out of the dialogue? Lost focus? So whose the Lead? Barbie Hsu? 🙁 It kinda looked like The Tourist in the making???? Good casting, bad twist and dead climax….please let me be wrong or else I’ll blame that on the trailer…..
Hmmm…I don’t know I love Chun but I typically don’t like this type of movies. How come he is always in martial arts? BINGO, liked him too but he REALLY can’t act. Anyway, very excited for this! Not a bit fan of Barbie Hsu, but I’ll do my best to stomach her. Everything else about this looks great.